If you’ve got a yard that’s too much work to walk but not quite big enough to ride (or your wallet isn’t quite ready for a quality riding mower), then finding the best self-propelled lawnmower may be just what the doctor ordered. There are lots of options available: some mowers have enormous cut diameters and can plow through thick grass while others are a lot friendlier to that budget you’re trying to keep. When it comes down to it, the best mower for you will be the one that ticks your specific boxes. So with that said, let’s take a look at our top picks! Remington’s mower is one that can check a whole lot of those boxes you may have. The cut diameter on this one is 21 inches, which is about as big as cut diameters get on mowers. It may not be a make or break feature, but bigger cut diameters mean that you won’t have to take as many passes through your yard to get it all cut. This mower comes with the option to side-discharge, mulch, or bag your grass after you cut it. No worries if you don’t know what that means, we break it down for you in the Frequently Asked Questions section (so you might want to read on). This mower comes with six different height adjustments ranging from 1-1/4″ to 3-3/4″ so there are plenty of options to customize how you want your yard to look. The Remington here will let you select between front-wheel, rear-wheel, and all-wheel drive. Each of these has its benefits, but the ability to choose which one you want is very rare. We break down the benefits of each of these options in the Things To Know Before You Buy section, so just be aware that this mower is suited to a very wide range of yards. This mower is gas-powered. That’s neither a pro nor a con but is something to be aware of. The initial upfront cost will be less, but the mower will cost you more over time than an electric mower. Gas-powered mowers are most often a bit stronger than their electric cousins, so you can be sure that this mower will annihilate some thick and tall grass. This mower allows you to customize how fast you want it to go, so it’s a good option for slow-walking people, as well as those who like to simulate an Olympic-worthy sprint while mowing the yard. This is the best self-propelled lawnmower for anyone who wants a gas mower with lots of customization options and it’s the best pick for someone who has a varied terrain in their yard – some bumps, some plains, and a whole lot of grass. The XD allows you to choose between side-discharge, mulch, and bagging options for your grass. It comes with 7 height adjustment options ranging from 1-3/8″ to 3-3/4″ so you can trust that you’ll be able to customize the yard how you want it. This mower is rear-wheel drive. No worries about gas, oil changes, spark plugs, etc. All-in-all, this is a great mower for those who are wanting an electric self-propelled lawnmower because they’re less hassle than a gas mower. Since this mower is rear-wheel drive, it’s best suited for yards where you won’t have to follow lots of contours. POWERWORKS has made a mower that is a great option for those looking to buy a budget electric self-propelled lawnmower. 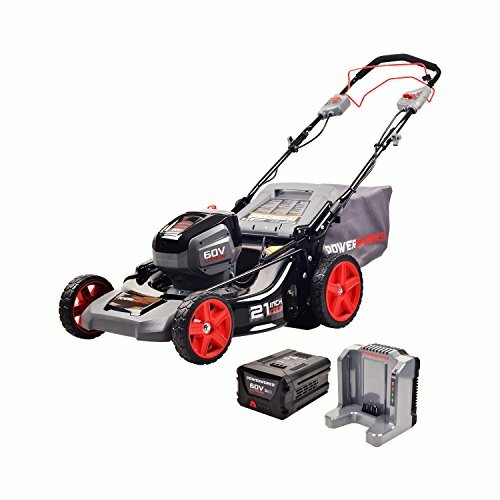 This mower has a 21-inch cut diameter and comes with a single 5 Ah battery with charger. The charger isn’t a rapid charger, so you may need a few hours to get your battery up to full par, but this battery should be able to last you for about 45 minutes before giving out. The mower does come with load-sensing technology and due to the higher level battery, can put out quite a bit more force than the Snapper we reviewed above. This mower is rear-wheel drive, so it’s a good option for lawns with a thicker grass or lawns without many natural areas you’ll need to cut around. This mower has the option to come without a battery if you already have one. Choosing the no-battery-included option will leave a battery and charger on the table, but you will save a significant amount of cash compared to other self-propelled electric lawnmowers. The POWERWORKS mower comes with the option to side-discharge, mulch, or bag your grass and comes with 7 height adjustment options, so you can get your yard looking how you like it. The speed is adjustable. This mower allows you to adjust your speed and has an easy one-button push start. The initial cost for this mower will be higher if you’re purchasing a battery with it, but this mower can be even less expensive than a gas mower if you already have a suitable battery and you’ll save money on maintenance in the long run. 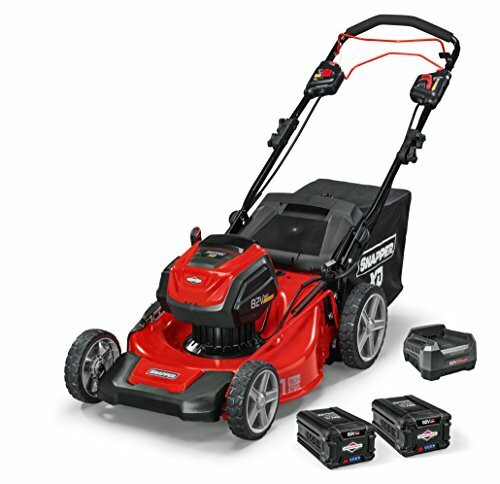 Since this mower uses a stronger battery, you won’t be sacrificing on power with this one. POWERWORKS provides a 4-year warranty on the mower and a 2-year warranty on the battery and charger (if you purchase them). This is a good option if you already have a battery that will work on an electric mower or if you’re looking for a more budget-friendly option. This mower doesn’t sacrifice on power, so it’s a good pick if you have tall or thick grass. Troy-Bilt’s 21-inch mower packs as much of a punch as the best of them, but it doesn’t stand out in too many ways. This mower offers options to side-discharge, mulch, or bag your grass and comes with 3 height options ranging from 1-1/4″ to 3-3/4″. That’s a wider than normal range of height from low to high, but it feels like only 3 options is a little restrictive. Even so, this mower will allow you to customize your yard’s look pretty well. This mower is front-wheel drive and doesn’t weigh much compared to other mowers, so it’s easy to twist and turn around your yard as you please. This is a nice perk if your yard has lots of contours or natural areas. There’s no speed control on this mower, so you may think it’s either going too fast or not fast enough. Troy-Bilt’s mower comes with a 2-year warranty. 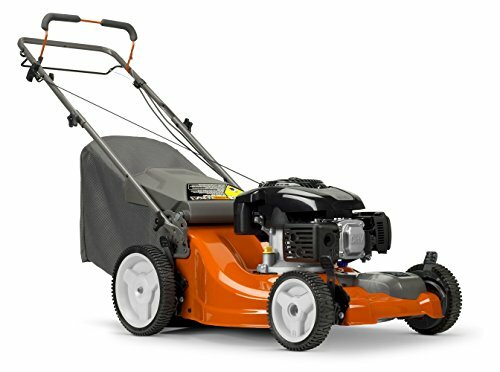 This is a fine mower if you want an option that’s very lightweight, but it misses features that other mowers have and doesn’t come in at a better price point. Husqvarna’s mower is a good option on the market today but doesn’t offer much that other mowers on this list can’t beat. 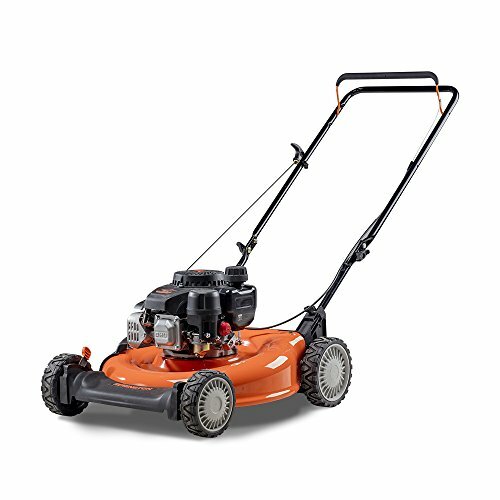 This mower has a 21-inch cut diameter and is gas-powered, so you can rest assured that it will cut through some mean grass. There are options to side-discharge, mulch, or bag your grass so you can do with the clippings as you wish. This mower comes with 4 height adjustment options ranging from 1-1/4″ to 3-1/2″. These options should get the job done, but it’s less than other comparable mowers in this review. The Husqvarna is front-wheel drive and is one of the lightest mowers on this list, so it’s a good mower if you have a lot of curves in your yard or want to avoid the natural areas. This mower’s light weight makes it easier to maneuver and turn how you like it. This mower doesn’t have any sort of speed control, so it may either go too fast or not fast enough for your liking. After searching on Amazon and the manufacturer’s website for this mower, we weren’t able to find any sort of warranty information. This mower is powerful and can get the job done, but won’t be kind to your wallet and doesn’t include as many features as other, more budget-friendly options. Other options could possibly be better suited for most consumers. Different self-propelled lawnmowers come in front-wheel, rear-wheel, or all-wheel drive. Each of these has its own distinct advantages, so let’s take a look at which ones may be best for you. Front-Wheel Drive: Makes maneuvering the mower easier since the mower is being pulled behind the front wheels. You’ll be better off getting a front-wheel-drive mower if you have lots of curves in your yard, natural areas that you’d like to avoid, or will be needing to turn a lot for other reasons. Front-wheel drive makes bagging your grass a little more difficult since there’s a lot of weight behind the mower. Rear-Wheel Drive: Allows for a more powerful push forward than front-wheel drive, but is a little more difficult to turn and wiggle around. These mowers are best suited for yards with humps or hills, but not great for yards where you’re going to need to be doing a lot of turning around natural areas. All-Wheel Drive: Provides you with even more power than a front or rear-wheel drive. These mowers are ideal for large yards, yards with lots of bumps, or yards with hills. Since these mowers are propelled from the front and rear wheels, you’ll get excellent traction in any yard, but may have trouble turning. If you would like to read more on the topic, Lowe’s has an excellent diagram explaining the pros and cons of each type of mower. On this list we took a look at both gas powered and electric mowers. Each one has its own benefits and challenges, so we’re going to break those down for you. Gas mowers will tend to be a lot nicer to your wallet on day one, but it doesn’t take too long for the honeymoon phase to give up the ghost. Gas mowers require a myriad of maintenance: they’ll always need more gas (mowers have to eat too), you’ll need to change the oil, spark plugs, keep an eye on that air filter, and you’ll always start the mower by pulling on the dreaded rope. Angie’s List has a list of things you’ll need to keep an eye on. Electric lawnmowers tend to run your bill up on the initial buy, but don’t require as much work over time and are less subject to wear and tear. Keep in mind that it may take years to recoup your costs though. In the two electric mowers we looked at today, the battery is the biggest distinguishing factor between mowers, so it’s important to choose the option that’s right for you. It’s helpful to remember that one of the biggest expenses of maintenance for your electric mower will be your battery. You’ll never have to change the oil, spark plugs, or refill on gas, but one day your battery will give out on you. For that reason, we at OwnTheYard recommend mowers that come with 2 batteries. 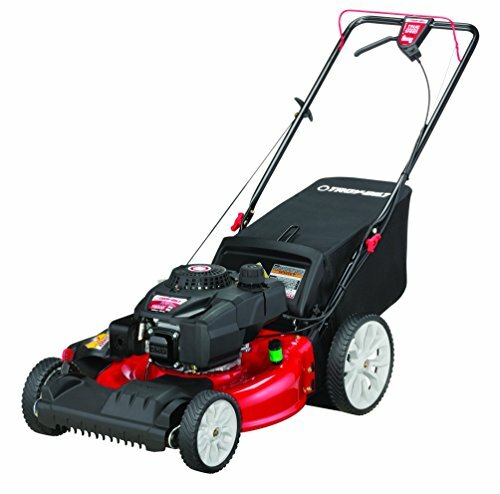 Can I change the speed on my mower? For 3 of the 5 mowers we reviewed, you can change the speed. None of the mowers will go fast enough to get away from you, but if you enjoy cutting the grass faster than your neighbor, you can show off in all your speed-cutting glory with most of the options on our list. Can I deactivate the self-propel feature to push my mower? It’s best not to push a self-propelled lawnmower. It can hurt the propelling mechanism. Powerworks was founded just in 2016, but they have already become well known for their high-quality tools and powerful electric solutions. They want a future of no fume and no fuss so your yard can be how you’ve always dreamed it to be. Troy-Bilt changed the world of farming back in 1937 by revolutionizing the rototiller. Even today, Troy-Bilt strives to help people achieve the American Dream by keeping their jobs in the United States and providing everyday people with the tools they need to own their yard. Husqvarna is one of the world’s leading providers in a variety of equipment ranging from snowblowers to chainsaws to our very own self-propelled lawnmowers. They’ve been at the game long enough to have built a reputation as a solid company for all of your landscaping needs. Thanks for reading our guide on the best self-propelled lawnmower! When it comes down to it, the best option for you is going to be the one that suits your specific needs. Ask yourself if you want gas or electric, power or long-term savings. Our favorite option for a gas powered mower is the Remington Pioneer. If you’re looking for electric-powered, we recommend the Snapper XD. Whatever option you prefer, a self-propelled lawnmower is a great choice for yards ranging from small to large. These mowers aren’t too pricey but can still mow lawns that have a whole lot of acreage.